Williams Lift Company is a division of Williams Surgical which was opened in 1947 by Thomas E. Williams. It continues to be owned and operated by the Williams Family to this day. Barry Williams, Thomas’ son, joined the business after graduating college in 1970 and is the current owner along with his wife, Judy. Their daughter, Laura, joined the business in 1992 and is the general manager. Laura’s husband, Richard, came on board in 2004. Their other daughter, Susan, came on board in 2006 to create a truly family-owned and operated business. Our valued and dedicated employees have been with the company for many years. They include our secretaries, Nancy and Jackie, our sales representatives, Scott and Dan, our head-technician, Steve F, and our service technicians/installers, Richard, Steve G. and Dan. All of our technicians have been factory-trained and are certified installers. 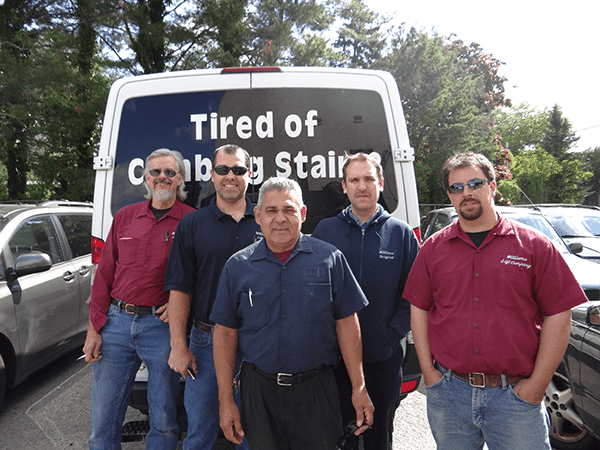 We are proud to say we have received many calls and letters over the years praising our technicians and installers for the quality of their work and kindness to our customers. Because of them, we have been able to become one of the most trusted companies in North and Cental Jersey including the 07023 and 07083 zip codes. If you are searching for stair lift dealers that serve NJ, do not hesitate to contact us. We pride ourselves on our service after the sale. Our repair department is available for Bruno and Acorn stairlift repairs 24 hours a day, 7 days a week. Treat our customers the way we would expect to be treated ourselves. For more information on all of the products we offer to the New Jersey and North Jersey areas, please contact us today, or make an appointment to visit our showroom at 24 South Avenue in Fanwood, NJ. Prior to Superstorm Sandy hitting in late October, and anticipating a power outage and battery shortage, we ordered large amounts of batteries for our stairlift customers. Since the stair lift batteries operate for a limited time after a power outage, we knew we would be inundated with repair calls and we wanted to be fully prepared to keep our customers mobile and safe. In case we had to close our store, we decided to put a recording on our phone which thoroughly explained to our customers what steps to take in a power outage to preserve the battery life and use their stairlifts sparingly to go up and down the stairs until we could make a service call to their home. Our efforts were successful and our thousands of customers in NJ were fully operational within a week of the storm’s arrival due to our dedicated service technicians staying on the road late until their service calls were completed. Our New Jersey installers are prepared to help. Contact us today!